A leaked out of the box Moto G5 Plus photo, has been uploaded by a Brazilian user, on Google+. 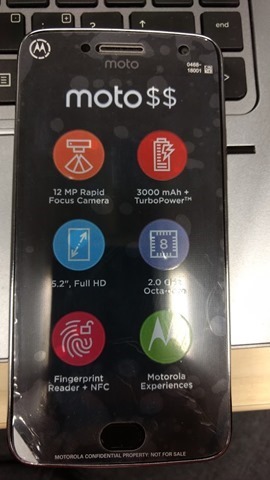 The devices has some test markings, and a sticker on the display, which reveals the key specs of the phone. It does look like the real deal, but as with any leak, we are skeptical about this one too. The Moto G5 Plus will sport a 5.2-inch Full HD 1080p display, instead of the usual 5.5-inch screen, of its predecessor the Moto G4 Plus. There aren't a lot of good Phones in the 5.0-5.2 size range these days, so this is good news. But whether Motorola will have another variant to cater to the fans used to the 5.5 design style. Another difference is the fingerprint scanner, which is not square, but an oval one. The phone will have NFC support, and will be backed by a 3000mAh battery. The G5 Plus will be powered by an octa-core 2.0GHz processor, which is likely the Qualcomm Snapdragon 625 (similar to the Redmi Note 4). The Moto G5 Plus seems to have a laser assisted autofocus, because the leak mentions a 12 MP camera with Auto Focus. There is no information about the operating system, but Motorola has a fantastic OS record, so we can safely assume it to be running on the latest version of Android 7 Nougat. We have no idea about the Moto $$ in the picture, perhaps it is to hide the device’s name or is it a clue about the codename? Fun Fact: The Moto G has always been named after birds. The Moto G 1st Gen was the Falcon (Moto G3 was Peregrine), the Moto G 2nd Gen was an eception though with the codename Titan (Titanis bird?) and the Moto G2 LTE was Thea. The Moto G3 was the Osprey, the G3 Turbo was Merlin. The Moto G4 was the Athene while the G4 Play was Harpia. Could the Moto G5 Plus be the Dollarbird?